John Peel Clapham, a lawyer from Leeds, came to Burley in the early 1830s and for a time rented Burley Hall. There he lived with his wife, his own mother, two sons and two daughters. 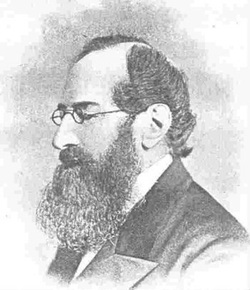 Clapham was a keen independent churchman, who had founded Sunday schools for the working classes in Leeds. Burley was a growing industrial village and no doubt had something of a “youth problem” on Sundays, when the mills were not working. Such schools were seen as a way of controlling the youngsters on their day off, as well as offering them education with which to improve themselves. Burley had a thriving Methodist chapel and Sunday school opened in 1816, but the Anglican chapel, St. Mary‘s, run by a curate from Otley parish church, was more moribund. This curate and Clapham decided to found an ecumenical Sunday School in 1835. It was popular for a while and Clapham bought the three cottages next to St. Mary‘s in Main St, converting the upper rooms into a school. The ecumenical arrangement ended when in 1837 a new Anglican curate, pressured by a narrow minded Mrs. Anderton of Burley House, started a separate Anglican Sunday school in Back Lane. Clapham, to keep the peace, closed his school, but noisy protests from Independent church folk eventually led to its reopening in 1840. This was the start of Salem church and Sunday school. Clapham built the Grange as his home and provided Salem church, a schoolroom, a Manse and the burial ground, in 1840. He moved out of the Grange in 1848 to Leeds, before dying in Ilkley almost 30 years later. The family gravestone can still be seen in the old burial ground at the back of Salem church.